Volunteers are the lifeblood of any ministry. Especially of the children's ministry. Simply put, our size, numbers, and needs are significantly greater than that of any other ministry department. So we need a lot of volunteers. All.The.Time. In this blog post I compare volunteers to a garden, and share a couple of simple yet powerful ways I water and nurture my garden throughout the year. Today, I want to give you a sneak-peek into the summer recruitment campaign that I will be launching in a couple of days. This Sunday, I will have 3 minutes of stage time. We're talking about 180 precious seconds when the eyes of the entire congregation will be on me. I get this golden chance only twice a year—3 minutes for the summer and 3 minutes for the school year recruitment. I cannot afford to squander this special opportunity, because I won't get it again for a long time. How can I make my announcement engaging and fun? How can I make it actionable? Here's what I came up with for this Sunday. How will I make my announcement engaging and fun? I will tell short, made-up, and entertaining stories, and illustrate them with fun illustrations. Story #1: A family gets home after a long day. They order their favorite pizza. 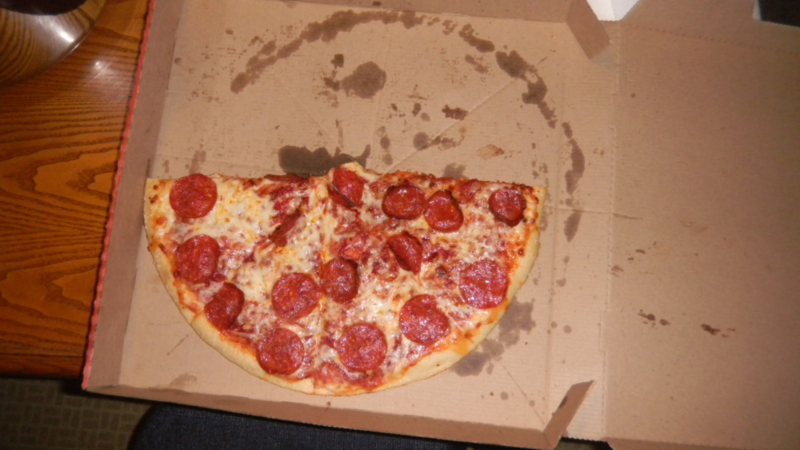 They say grace in a hurry, and open up the pizza box only to find this..
BUMMER! Half of pizza is gone! (The pizza delivery guy must have been hungry too!) The night is ruined. BUMMER! You left it there a little bit too long. The sweater is shrunk! The job interview is ruined. By this point I expect people to be engaged and relaxed. This is where I will introduce my final story. Story #3: Every Sunday your children come to church, there are 154 KidMin volunteers ready to play with them, laugh with them, love on them, listen to them, point them to Jesus, teach them God's Word and pray for them. AY! The team is complete. All is well! However, our faithful KidMin volunteers deserve a break. So just like we do it every summer, starting in June most of our volunteers will be taking the entire summer off. This means that when your family comes to church on June 9, this is what the children's ministry team will look like. BUMMER! We will be seriously outnumbered by the children! 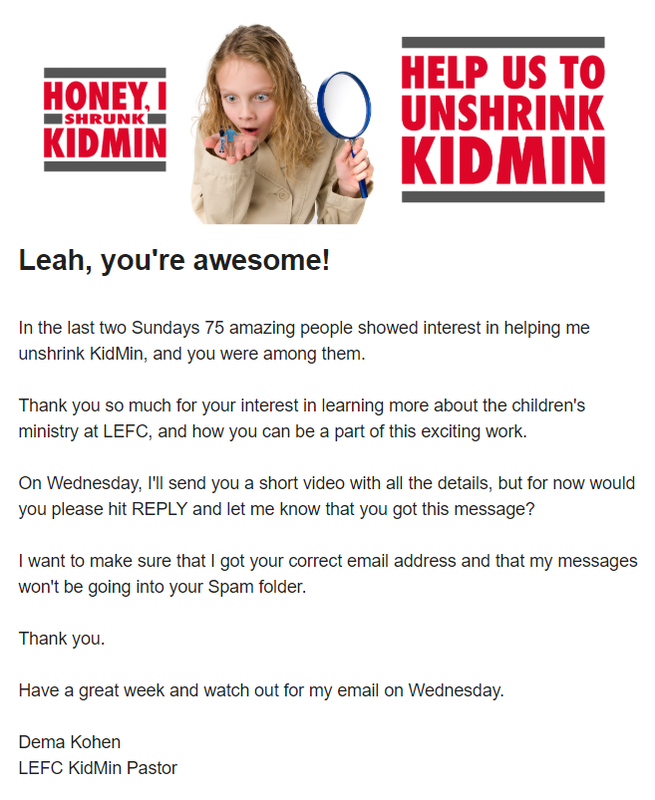 A shrunken children's ministry is TRAGIC! You can change the way this story ends! 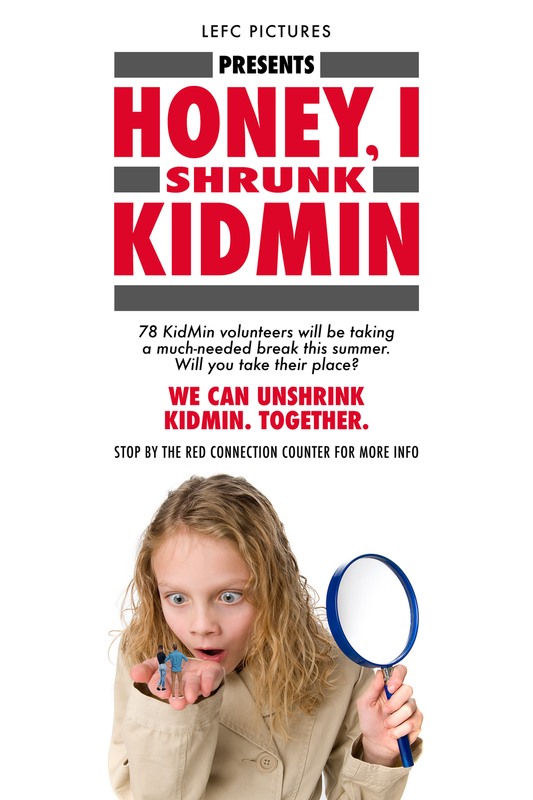 You can unshrink KidMin by giving three-four, or even more Sundays this summer to serving the children of our church. If you think you can help me out a couple of Sundays this summer, please fill out your bulletin insert, and drop it off at the Red Connection Counter. This will let me know that I can count on you this summer, and will also give me a chance to share with you more specific details. How will I make my announcement memorable? 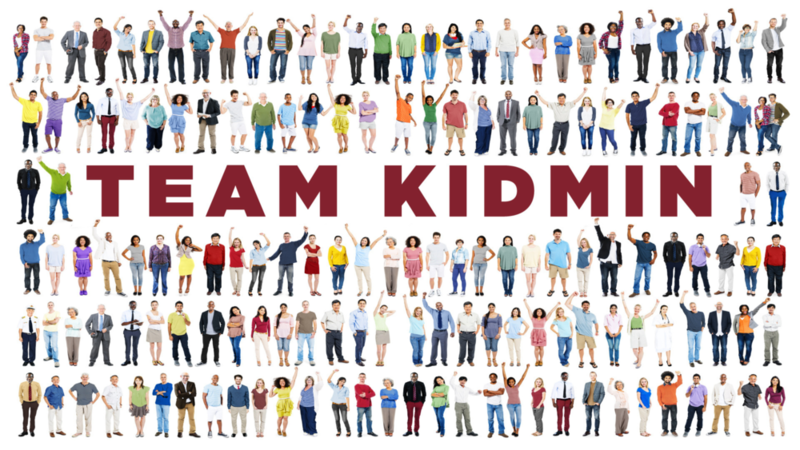 By using a powerful visual contrast of what a complete and incomplete KidMin Teams looks like. How will I make my announcement actionable? Everyone will have eye-catching, hard-to-miss bulletin inserts in their hands. All they need to do is write in their name, email address, and cell #, and drop them off at an easy-to-find spot. It is crucial that the next step we ask people to make is clear and simple. Notice, I'm not asking people to pick the age group they want to serve. I'm not even asking them to indicate what Sundays in the summer they will be available. And I am not telling them about the summer orientation meeting, background checks, lesson plans, communication, and a dozen of other things that go into making summer children's program happen. I'm only asking for a small initial commitment, and a chance to start a conversation with them. All other details will follow when the time is right. For now, all I ask for is their name and contact info, so we can start talking and planning. This is it. This is my plan for Sunday. My goal will be to make people laugh, think, and commit. And it goes without saying, that this effort will be soaked in prayer. Because no matter how cute and clever our methods are, unless the Lord tugs on someone's heart, even our best efforts will be in vain. Yesterday’s big stage announcement went great! People listened… laughed… and filled out the interest cards. Here’s the proof. 26 applications (33 people in total)! Most of them coming from the people that never served in children’s ministry. That is such a wonderful response! I am good at coming up with plans, executing them, and then moving on to the next project. However, this time I felt it was important to pause and celebrate. Next step is to process and organize all these cards into one simple, easy-to-use table, and start engaging with the people who expressed interest to serve. Since my original big stage announcement in church, 75 people have filled out the interest cards. This is an overwhelming response, considering that 90% of these people have never served in the children’s ministry. So we really are getting a brand new, fresh-off the boat army of volunteers. That’s exciting! One thing to notice — the language we use in our communication with potential volunteers is very important. For example, I could have easily called the “I Can Help“ cards pictured above commitment cards, but I didn’t. Because the word commitment is too strong. It implies some sort of obligation. Most people already feel over-committed and over-scheduled, so instead of presenting it as a commitment, I presented it as an interest card or info card. It’s a little thing, right? Commitment card or interest card — does it really matter? I believe it does, but I am not willing to test it and start calling it a commitment card. Besides, I didn’t want people to commit to something they didn’t fully understand or know about. So the interest cards were just that — expressing an interest in learning more about the children’s ministry in our church. Notice the graphics (email header) and the language in my email — it’s consistent with my big stage announcement. The idea is to make it feel like we are having an ongoing conversation. Subject: Leah, you made my day! Subject lines are powerful, they are the reason many people open or do not open their emails. So I made sure it was personal, positive, and intriguing. As promised, I followed up my first email with a second one that contains two very important elements: a short video and an online application. Now, this is where the fun begins. At this point a person’s initial interest will most likely become a firm commitment. There is a lot more chance that people will watch my video than read my words. Video is the best medium to capture and communicate passion and energy. Curious to see what my application looks like? Click HERE and you will see the exact same application that my potential volunteers are asked to fill out. There’s a lot more information that I could covered in my video. But I didn’t. There are a few more questions I could have included in my application. For example, I could have asked which orientation meeting a person would like to attend (we have one scheduled for May and another for June.) But I didn’t. I didn’t want to overwhelm people with too many details. Children’s ministry is a very complex operation. It’s easy to intimidate people with all the details and make them feel inadequate. So it’s our job is to clarify and simplify. Remember, we’re developing a relationship, and I am making sure to set the pace and give them bite-size pieces of information. The last thing I want to do is overwhelm them, and scare them for life. 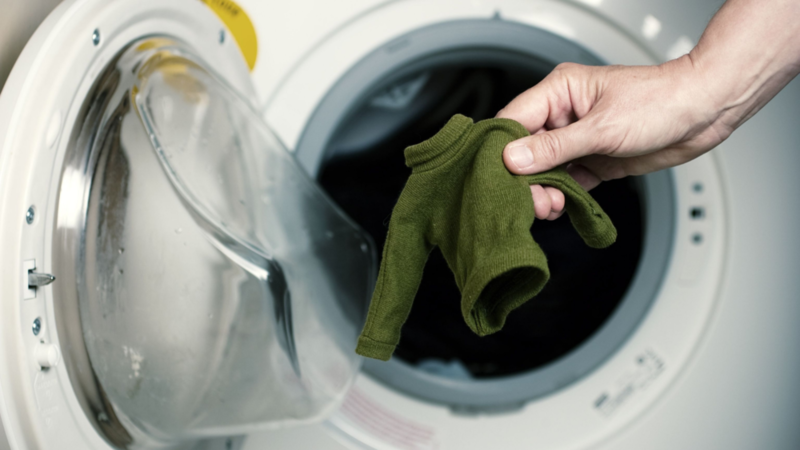 So when you craft your next email or video, ask yourself, What can I throw out? Strip your communication pieces down until only one, the most important thing remains. To systematize my approach, I created an infographic (see below) where I outline 7 key steps in my summer recruitment campaign. Hopefully, coupled with the blog post, this infographic will give you some helpful insights. Of course, my road map is not a magic formula, but I do believe that there are specific tools, patterns, and sequences that considerably increase the effectiveness of our recruitment campaigns. This infographic captures them well. You have my permission to save it, print it, and use it in any way it will bless your efforts of building your team.